Because we have so many pages of information devoted to the Talladega and Spoiler II cars we have developed an entire site devoted to just these cars. 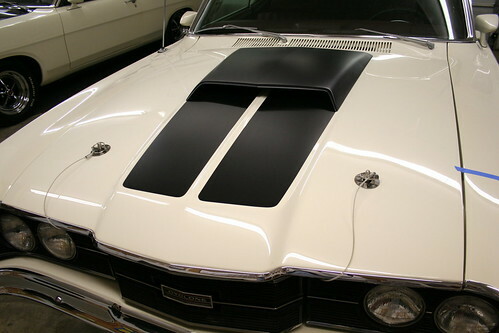 In addition that site includes the first ONLINE REGISTRY FOR THE 1969 FORD TALLADEGA, 1969 MERCURY CYCLONE SPOILER AND SPOILER II, THE 1969 MERCURY CYCLONE COLOR CODE CARS PLUS THE 1968 MERCURY CYCLONE GT 500 CARS (simply click here). We encourage you to visit that site as well as use the Search feature on this site to find out more about these rare and desirable cars. We often hear storing about the elusive rare car that once was but now no one knows where it is. One such car we first heard about was a 1969 Ford Talladega raced by a Sunday School Teacher and sponsored by Keats Ford. Most of us think of the Talladega as a NASCAR star from the 1969/1970 Aero Wars between MOPAR and the Ford Motor Company. However, that same aero advantage helped on the drag strip. Over the next few weeks we will tell you as much of the story as we can about one drag strip star that was lost but is now found. First off, you need to know the history of the Ford Talladega and why it is so special. The 1969 Ford Talladega and Mercury Cyclone Spoiler II were the Blue Oval’s designation for cars with the extended sheet metal on the nose. 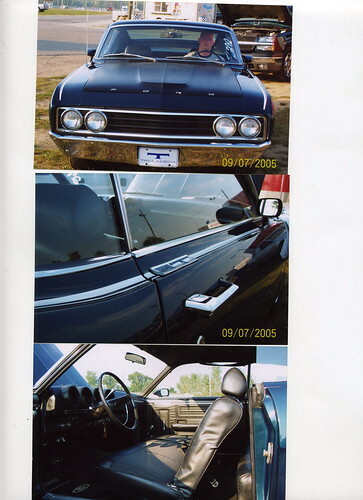 In this report we will focus on the Ford cars but we will deal with the MOPARs on another page. 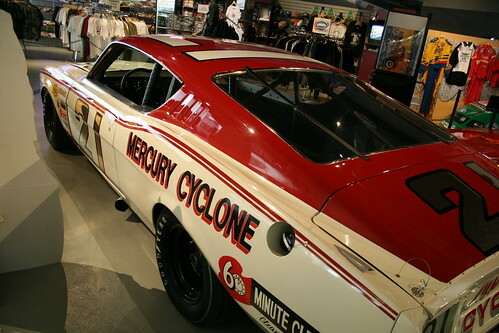 To build 500 such cars was a tall order for Ford and Mercury; each Talladega and each Cyclone Spoiler II had extensive new sheet metal added to the front of the cars. The entire front end was cut off just In front of the front tires and an entirely new, sloped nose was grafted to the original fenders. The front end of these cars were all hand built but the cars were all assembled on the regular assembly line. Many believe the Ford Talladega and the Mercury Cyclone Spoiler II are identical. 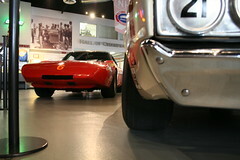 In fact the Talladega had only 15.5 inches added to its nose but the Spoiler II had 19.5 inches added. 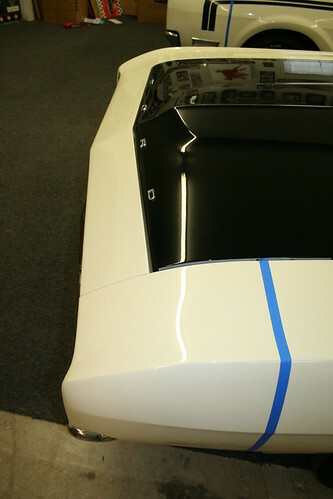 The Spoiler II’s nose is not only longer it is also built at a steeper 35-degrees vs the Talladega’s 30-degrees. 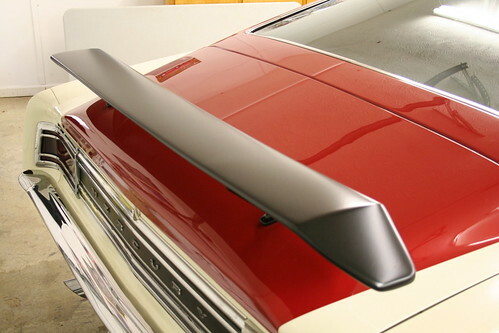 At high speeds these differences actually made the Spoiler II from 2 to 8 mph faster than the Talladega. Most also believe the Talladega and Spoiler II have identical bodies, this also is not true. The only shared components between the cars are their bumpers, grilles, door, and turn signals! This is a Spoiler II fender with all of the paint removed. You can see the original seams. 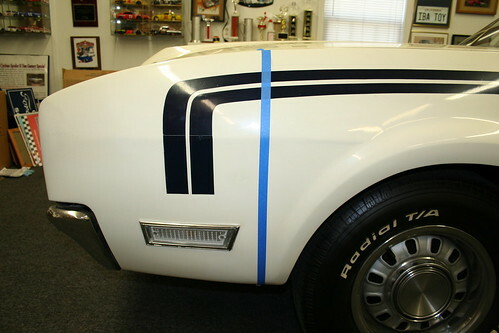 This is an original Spoiler II with the seam marked with blue tape. The metal to the left is the new aero metal. Notice how close the bumper sits to the fender compared to the standard production model shown below. 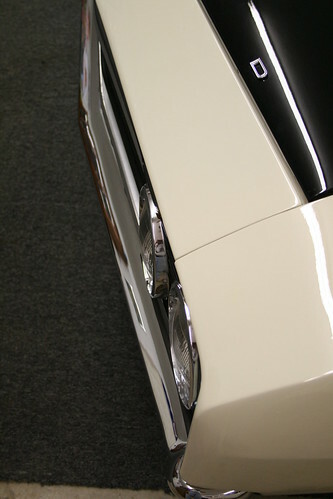 Above is a restored Spoiler with the correct “W” nose fender. 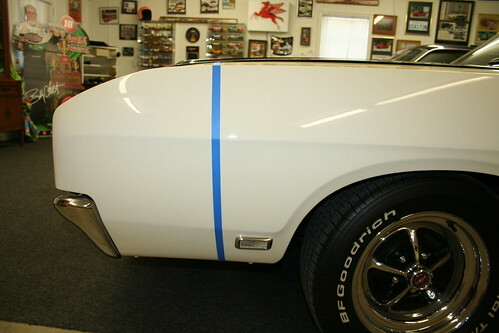 The blue tape marks the location where the factory cut the original fender to add the new aero metal. 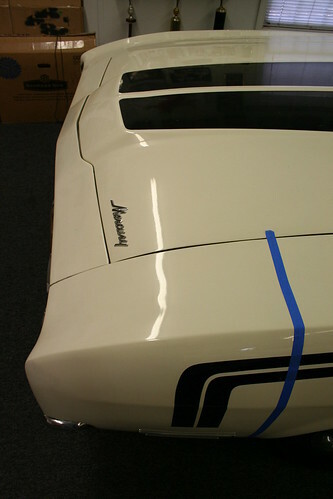 This is a Ford Talladega with the seam marked with blue tape. The extended nose is in front of the tape. 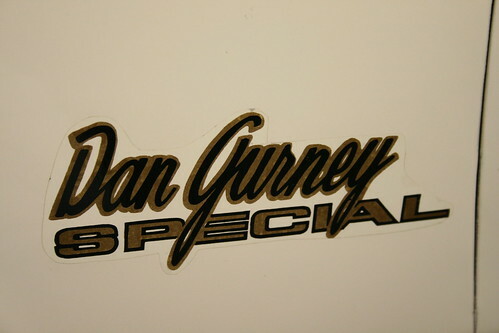 The Gurney Special will be Blue and White while the Yarborough Special will be Red and White. Only the Spoiler had a scoop and hood pins. No Spoiler II or Talladega should have scoops or hood pins. They were never available on these cars. Both the Spoiler and Spoiler II should have a rear wing. However, these were dealer installed and some were never installed. 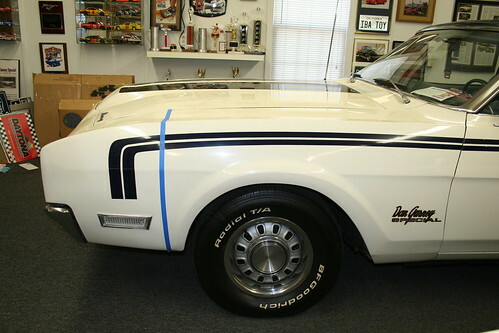 Most were painted in a non-gloss black but a very few Gurney cars have been documented to have Blue Spoilers when new. It is unknown if there were painted at the factory or by the dealer. So, what do you think of when you hear the word “Talladega”? Obviously for fans of NASCAR the track in Alabama comes to mind. But for those that remember a certain factory modified 1969 Ford Torino, Talladega is a rare car that brings back exciting memories of the fabulous NASCAR aero-wars of the late 60s and early 70s on the Super Speedways. Trying to save face the Dodge Boys, having been shown up by the newly introduced in 1968 Ford Fairlane fastback body style, decided the 1969 Dodge Charger needed to be a little more aerodynamic. The result was the beautiful limited production 1969 Dodge Charger 500. With a flush mounted grill and reworked rear window it had less aero drag, which is a huge benefit on the super speedways. However, the Dodge Boys were so excited about their new discovery they weren’t too good about making it a surprise to the rest of the racing community. 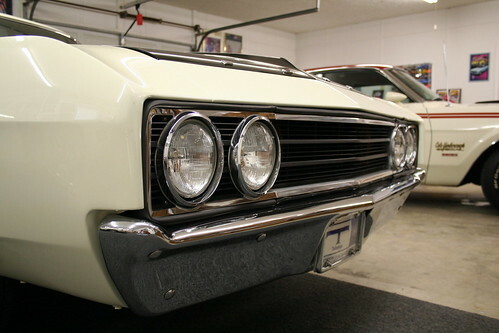 Hearing what the Dodge Boys were up to, Ford went back to the drawing boards with its 1969 Torino fastback. They brought in outside help from factory backed race shop Holman and Moody. These guys were wizards and came up with some aerodynamic tricks for the already slippery Ford and Mercury fastbacks. 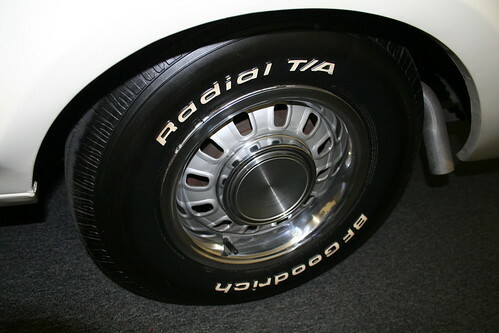 The wheel shown on this Talladega could have been installed at the dealer but is not correct from the factory. All Talladegas came from the factory with white wall tires! 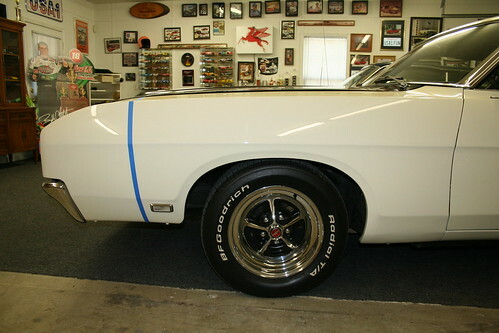 All Spoiler IIs had white letter tires. On the Spoiler the tire and wheel combinations could be anything on the option list. It is difficult to see due to the reflections in this Talladega bumper but look closely and you can see the modifications to the end and top of the bumper. 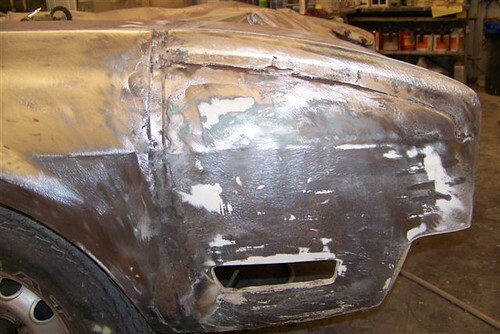 Ford took a rear bumper, cut it into three pieces, reshaped it and filled in the openings on the ends and made a new front bumper for the Talladega and Spoiler II. These new front bumpers acted like a rudimentary spoiler for the front end. One of the interesting changes that Ford made only to the Talladega is the staggered rear shocks. The Talladega is the only Ford built with an automatic transmission to get such a treatment. You can identify the Talladega in a number of ways. 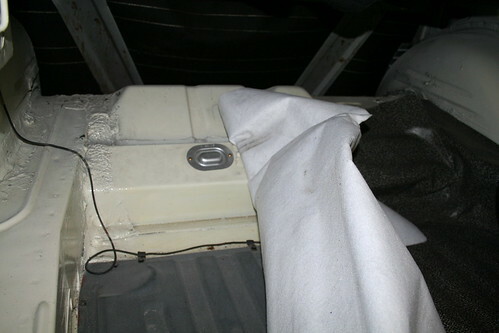 In the trunk you will find an unusual sheet metal box that covers the rough cut holes in the trunk floor for the staggered shocks. 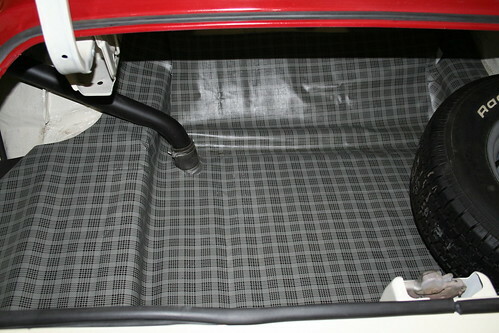 This is a Talladega with the trunk floor mat pulled back. 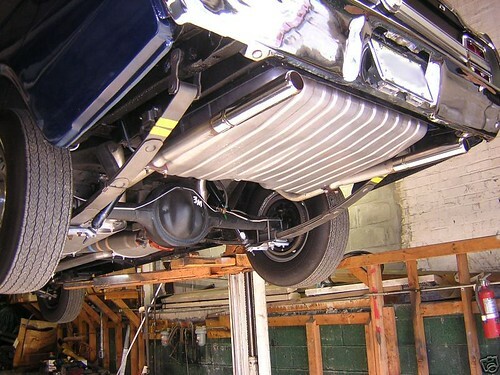 This is what a standard Ford Torino or Mercury Cyclone floor should look like in the same location. The Spoiler II did not get the staggered shocks. 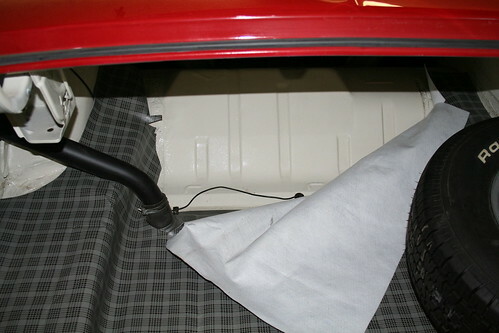 Even with the trunk mats in place it is easy to see the difference, this is the Spoiler. This is the Talladega, you can see the outline of the sheet metal box under the mat. 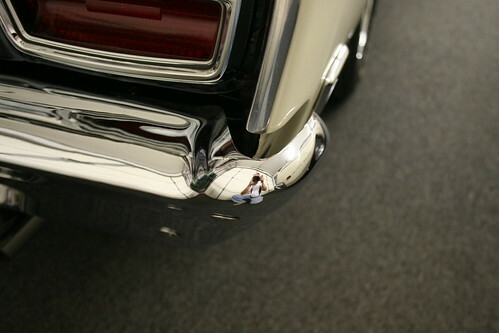 The specially built 1969 Ford Talladega and 1969 Mercury Spoiler II resulted. Among the changes, the most obvious included the longer front fenders that extended the snout, and had an angled front that connected the now flush mounted grill opening back into the hood area. Special bracing was required to support the now “drooped” nose. 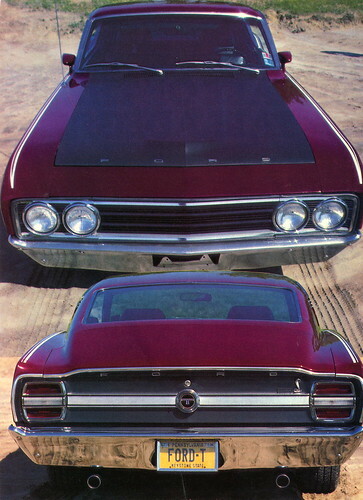 Holman and Moody also took 1969 Fairlane/Torino rear bumpers, and by sectioning them in the middle, made them tuck in closer to the body to catch less passing air and act as an old school spoiler for the front end. 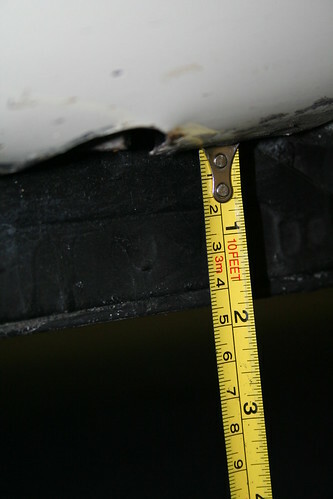 This bumper was used on both the Talladega and the Spoiler II. This is the rear bumper of a Talladega. 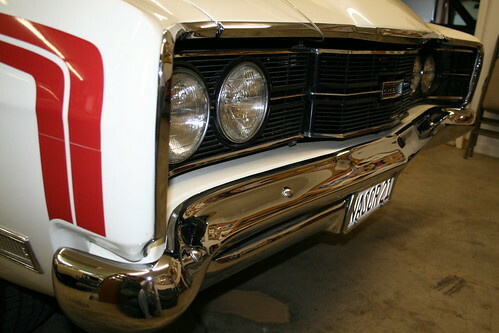 This is the front bumper of a Talladega, note the “V” shape not present in the rear bumper from which it is constructed. 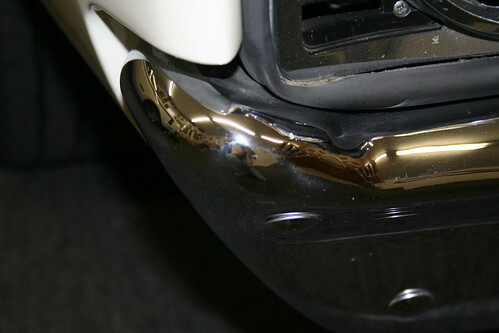 One critical change that many observers never notice is the modification to the rocker panels. They were re-rolled to provide a shallower rocker panel. 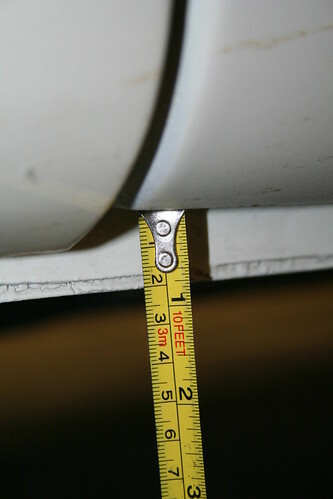 To determine how low a car could be for the race track inspection process NASCAR measured the rocker panels from the bottom edge. Due to the re-rolled rocker panels these cars could now sit 1″ closer to the track. 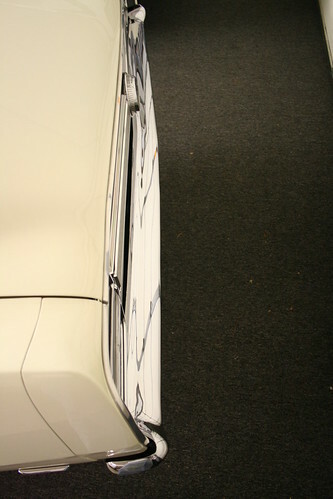 The cars now had a lower center of gravity that aided in better cornering. Here is a very basic drawing of the cross section of a rocker panel. 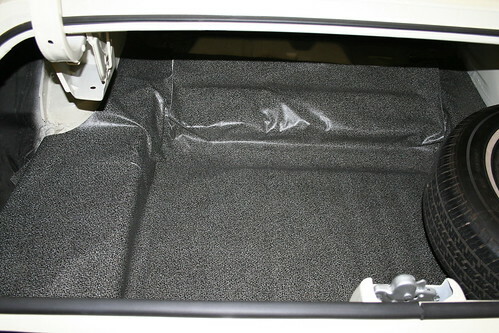 The dashed line is where the stock Torino panel would be and the solid line is the “re-rolled” Talladega rocker panel. You can also see why the excess metal at the bottom is now 1 and 3/4 inches long instead of only 3/4 inches as on the stock Torino. One of the biggest yet least noticeable changes to the Talladega and Spoiler II are the re-rolled rocker panels. 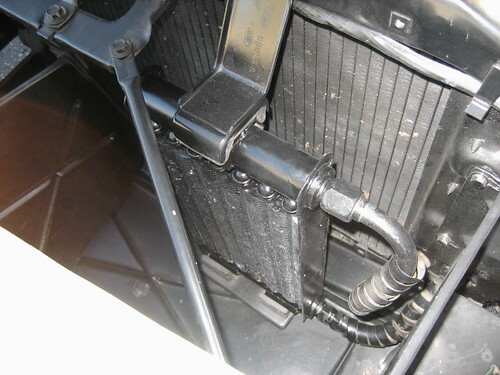 The photo above shows the metal lip at the bottom edge of the rocker panel. On a stock Cyclone or Torino this will be approximately 3/4 of an inch. NASCAR had restrictions on how low these cars could be built for the race track. 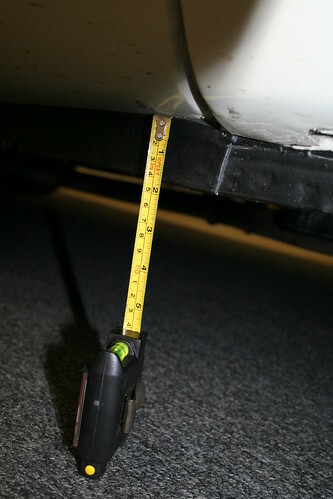 The officials measured the distance from the bottom of the rocker panel to the pavement to determine ride height. 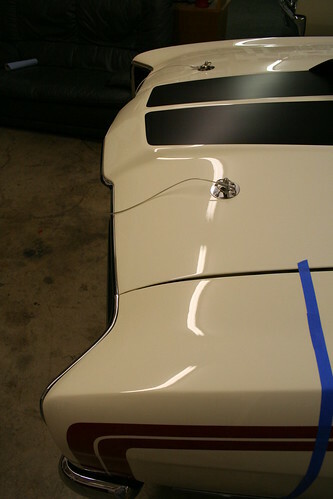 Ford re-rolled the rocker panels for the production Talladega and Spoiler II in order to legally lower the car on the track. Look closely and you can see the lip on this Talladega is 1 and 3/4 inches; 1 inch more than the stock Torino or Cyclone. It is painted black in these photos. To get the car lower for the track this lip would simply be trimmed off and the race car could be 1 inch lower! To learn more about how the Factory made this modification, Click Here. There is nothing on the outside of a Talladega that says Talladega. 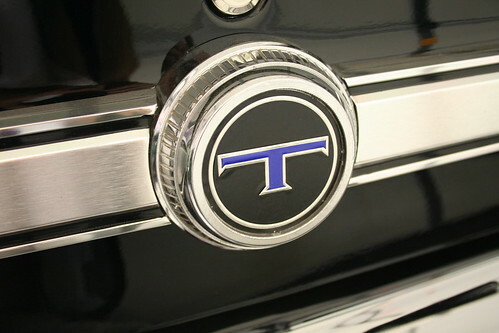 This large “T” is located on the “fake” gas cap in the center of the rear panel. 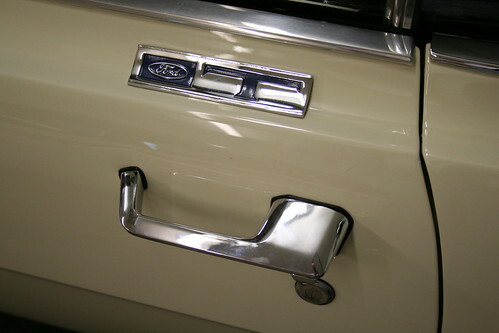 There is a similar “T” and Ford Blue Oval above the door handle on both doors. The only place that says Talladega is this badge on the door panels. Interestingly, the Spoiler II has no badges, decals or other identification which labels it a Spoiler II. The decals all say Spoiler. 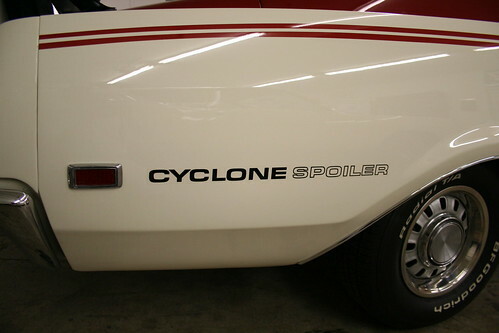 It is believed it picked up this name because it came out after the Spoiler and thus became Spoiler II. 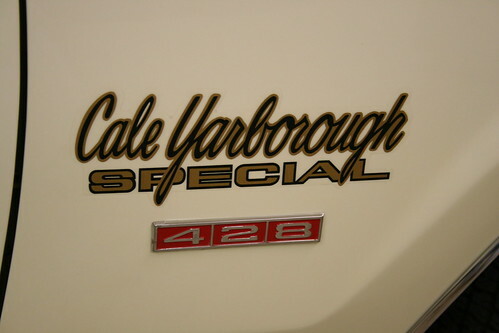 In order to comply with NASCAR rules, a minimum of 500 of these specially modified Talladegas and Spoiler IIs had to be produced and available to the general public. In January and February of 1969 Ford used its Atlanta plant to produce approximately 750 Talladegas. 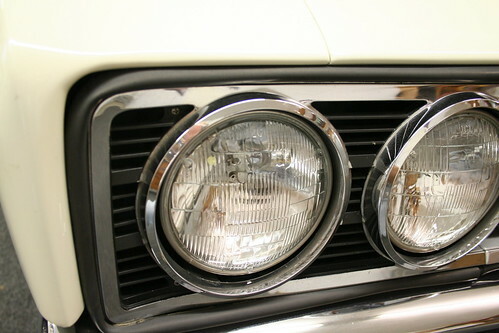 Production cars were available in three colors; Royal Maroon, Wimbledon White and Presidential Blue. There were Pilot and Prototype cars of different colors. 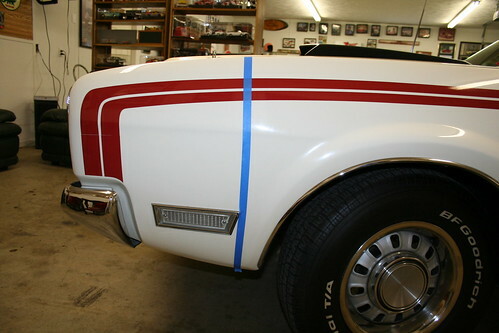 Maroon and blue cars received white pinstripes that ran along the tops of the fenders, doors and quarter panels, while the white cars received a black stripe. 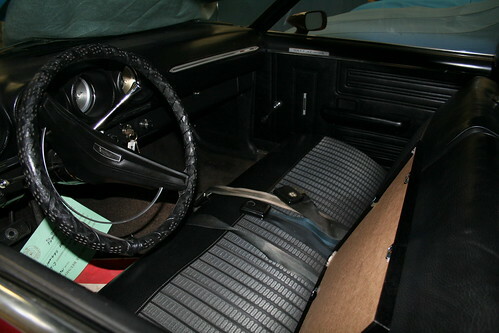 The interiors were all black vinyl, with cloth bench seats, no tach or clock, and just an AM radio. 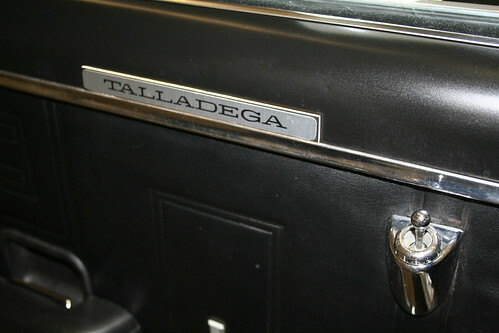 Talladegas were given special “T” plates on the doors just above the handles, a “T” in a circle on the rear, and “Talladega” nameplates inside on the door panels. All Talladegas were identical except for the paint. This is Royal Maroon Talladega. This is a Presidential Blue Talladega. The other photos on this page are examples of the Wimbledon White cars. 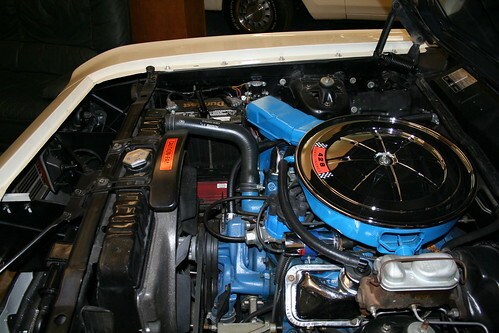 All Talladegas were built with the same 428 CJ engine and C6 transmission. No production Talladegas were ever built with other motors or transmissions, no 351s and no 4-speeds. 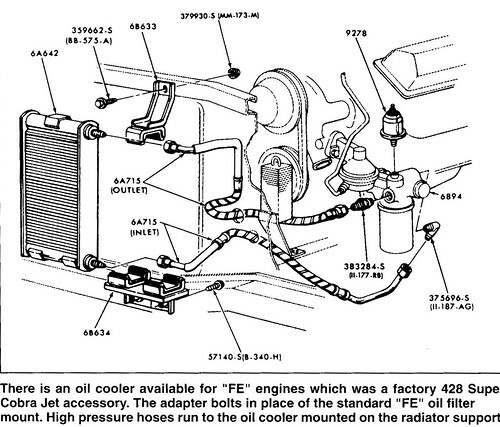 This Ford diagram show the oil cooler and power steering cooler. The only material correct for a Talladega is shown above. It is a cloth material and is available as a reproduction. All Talladegas received the 428 cubic inch Cobra Jet engine with a 10.5:1 compression ratio rated at 335hp, backed by a C6 automatic transmission. 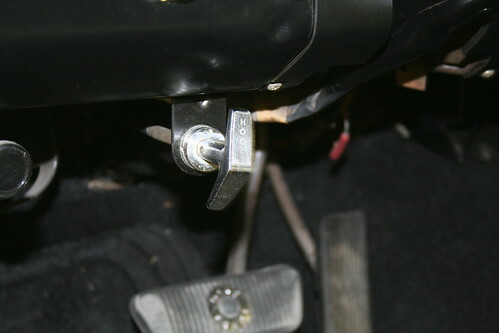 Staggered rear shocks were also used, along with a non-posi 3.25:1 rear end. Talladegas are the only automatic equipped Torinos to receive the Drag Pac staggered shocks. Ford won the Manufactures Cup in 1969, and David Pearson won the season championship and Richard Petty finished second both driving a Talladega in 1969. Talladegas finished first, second, third and fourth in the Championship points that year! Also, Richard Petty won his 100th race behind the wheel of his blue Talladega It was the only year that Petty would drive a Ford. Now that you know what a Talladega is we will begin the story of the lost Keats Ford drag race Talladega next time.